INN ON THE OCEAN, located directly on the Ocean, is a perfect blend of elegance, hospitality, quiet graciousness and beauty. All bed & breakfast rooms are magnificently decorated for luxury and comfort. From our wrap around oceanfront veranda you can watch the waves and world go by. In winter, a fireplace welcomes you in our living room. All guest rooms have Color TV's, VCR's, Ceiling Fans, Private Bathrooms, some with Jacuzzis, Bathrobes, and air conditioning in season. Expanded continental breakfast, afternoon refreshments, bicycles, beach equipment, health club facilities are complimentary. Our guests say it for us ... "Nothing as outstanding or beautiful in Ocean City; Magnificent, a real gem, one of a kind, a piece of Art; can't wait to come back again and again". INN ON THE OCEAN received Ocean City's Beautification Award and is a member of the Maryland Bed and Breakfast Association. The Inn is an adult, smoke free environment. INN ON THE OCEAN is perfect for romantic getaways, weddings, special occasions, and corporate meetings. We are Ocean City's Hidden Treasure. 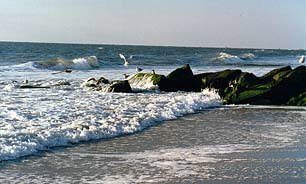 A deluxe, romantic, magnificently restored Oceanfront Bed and Breakfast / Inn. Oceanfront wrap around veranda. Fireplace in winter. Jacuzzis. Perfect for romantic getaways, weddings, special occasions, corporate meetings. Ocean City's Beauty Spot Award. This and other Ocean City Bed and Breakfast Inns can be found here in The Register.